There is new pressure on freshman Rep. Trey Radel (R-Fla.) to resign following his arrest for buying cocaine from an undercover cop. Republican Gov. Rick Scott and GOP state chair Lenny Curry, among others, have called for his resignation. Who was the last member of Congress to resign his or her seat following allegations of misconduct? Anti-Roberts button from his 2005 Supreme Court confirmation. Last week’s question was … Who was the last D.C. Circuit Court hopeful who was nominated by two different presidents and twice failed to win confirmation by the Senate? The answer: John Roberts — nominated by Bush 41 and Bush 43, but Senate Democrats each time refused to allow the nomination to come to a vote. 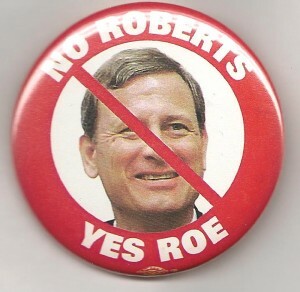 In 2003, after Republicans recaptured the Senate, George W. Bush resubmitted Roberts’ name and he was confirmed. He is currently the Chief Justice of the United States. And the randomly chosen winner to that one was … William Rose of Chattanooga, Tennessee.